Bowls with a low disc-shaped foot, reminiscent in form of an archaic jade disc (bi), both with a white glaze, made in north China, and with a green glaze, made in the south, were among the first high-fired stonewares to be exported to the Middle East. Since excavations in Samarra in the early 20th century for the first time brought to light bowls with this distinctive feature, the whole type has become known as Samarra-type bowls (or the foot as a Samarra-type foot). The design on the present piece has been carved into the glaze in modern times. The conical bowl rests on a very shallow disc-shaped foot and has a thick folded-over rim flange. The off-white body is covered with an opaque white glaze which leaves the foot, base and patches around it free. 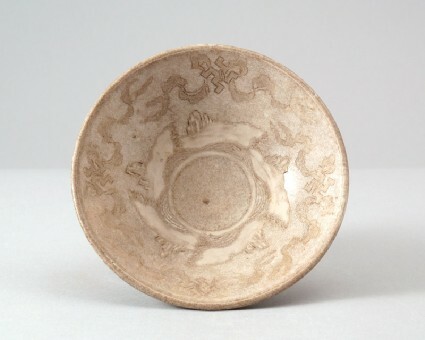 The glaze has a degraded, soiled surface into which a design of four swastica motifs tied with ribbons and a band of rocks emerging from waves has been cut after firing.